A nice quote I came across whilst reading “A Dog’s Purpose“. A beautifully written book all from a dogs point of view. It certainly made me think differently about Opal (my dog) and others, and perhaps why they think/act the way they do. Relationship endings are always bitter sweet. You say goodbye to the life you knew for the previous how many years, reminisce on all the memories, happy and sad times, and think of all the things that you used to do, places you would go and people you knew that will now change. If you look at it in a positive light it means that there is now room for new beginnings, many opportunities that can lead to an entirely different life. A new chapter for the book of you. Part of the reason my last relationship ended up parting ways was because I had a long hard think about what I wanted to do in and with my life and our paths just weren’t heading in the same direction. Fortunately for me the reason I had to have that honest conversation with myself turned out to be the first step in creating a new journey. Some people manage to go through life and have it just happen to them. I want more from life; I like the adrenaline, the excitement, the satisfaction of setting a goal and achieving it and overcoming the challenges that I face on the way. It may sound selfish, independent, or stubborn, but I like to do things for myself. If I have achieved it mostly on my own it feels like I earned it and can be truly content with the fact it is mine and I did it and no one else can take credit for it. I have always done that so i don’t feel like I “owe” anyone for helping me out. I even have a hard time having other people buy me a drink, or dinner, without me having to repay them in kind. After the necessary grieving period was over, I began to focus on the things that had made me come to that life changing decision in the first place. I wanted to buy a house, I wanted to travel the world, I wanted to have good real friends, I wanted to be a good real friend…and many more. I sat down and started to work it out using what I had been taught in school and throughout rowing training, if you are going to set a goal it needs to be SMART. Specific, Measurable, Attainable/Achievable, Realistic and Timely. I wanted to travel overseas. I thought about where I most wanted to go, how much time I could realistically go for, what the main things I “had to see” if it was my only time going over there. Then looked into the best way to fit those in, priced up the options, worked out how long it would take me to save/pay for the trip and started booking. I also wanted to buy a house. Again I worked out what I wanted in a house, what area I wanted to and could afford to live in, how much I had in my Kiwisaver, what I could realistically afford that I would be comfortable living in and how much more I needed to save to get there, and also about the timing of it – whether I bought it before or after going overseas. Fortunately I have a good job with a regular salary and a decent amount of leave. Because I had planned these two main goals out in a lot of detail I then spent the next year and a bit saving, booking parts of my trip, looking at the housing market – keeping an eye on the prices and how it kept changing. With goals and a plan I found it easy to see the end in sight and managed to go to Europe/UK for 6 weeks and come home to buy a house the following month at the end of 2016. Both of these goals had the added bonus that I was focused on something different. I was learning a lot about houses, the market, the whole process and a lot about the world, places to go, what to do and see, which in turn meant I was surrounded with an entirely different group of people and it opened me up to a lot more conversations with the people I already knew. I met a huge range of different people just through thinking and talking about these adventures I was planning on having and while I was living them. I look at every experience as an opportunity to learn a lesson, or three, then I look forward to using those lessons to create something even better in my next chapter. Those were my main goals for 2016 and since I have accomplished them I am now figuring out what’s next and how best to achieve that. The past two years really have been a life changing experience and many many new doors have opened thanks to one door closing. Bitter sweet, yet onwards and upwards. This seems to be a reoccurring question; when you are little and can be anything you imagine, as you get to high school when you are choosing which subjects to study, when you finish high school and need to decide your next path, when you finish university – where will you start your career. As time goes on more and more of your life choices depend on how you answer this question. Believe me as you enter your 20’s and ask yourself this question frequently, and have others constantly asking, it starts to sound bewildering. Growing up I always thought the pathway was: complete high school, attend university & gain a degree, get a job in the field you studied and build a career in that line of work. When I finished high school that was a daunting thought – I have to choose right now what job I want to do for the rest of my life! Of course I went with my favourite subject at high school – PE. As I was an avid sports player throughout high school it just seemed a natural path to follow. However after two years of studying a Sports and Exercise Science degree I was asking everyone in my class what they wanted to do when they finished. Majority of my classmates said “become a PE teacher” or “become a personal trainer”. As I was still quite young and a little naïve my thinking was, “well that doesn’t sound like me for the rest of my life”. I didn’t realise that just because most people wanted to follow two main careers, there was a lot more available using this degree. Unfortunately as I came to that conclusion I withdrew from my degree with only one year to go, and went to work in hospitality while I figured out what my new career path would be. Now what do I want to be when I grow up? Well after 5 years of working in various roles in hospitality I decided waitressing and bartending were not the career paths that I wanted. One of my waitressing roles expanded into assisting with planning weddings and functions. I loved the events planning side of this role and decided now that this could be a career I would really enjoy. At the time I was looking for fulltime jobs and it was a requirement to have a degree before anyone would consider hiring you. As I was just shy of completing my sports degree I chose to go back to university and do a degree in what I now enjoyed – event management. At the time the only degree at Waikato University that offered any event management papers was the Bachelor of Communications, so naturally this is what I chose to study. As I was in the last months of completing my degree majoring in marketing and public relations I again asked myself “what do I want to be when I grow up?” Now I have a degree what will I do with it? What career does this mean for me? Still thinking that your degree will lead to a career in the industry of what you studied. Well after temping full time for a variety of businesses for three months, and a large amount of interviews for marketing jobs, I weighed up my options again. If I was to follow what I thought was the right path – working in the industry I studied – I would have to get a marketing job in Auckland. This meant changing my whole life just to get a job. I could potentially get paid a higher starting salary than what was on offer in Hamilton, however that would mean having a higher cost of living and leave all my friends and the lifestyle I was used to in Hamilton behind. Again the question came up “what do I want to be when I grow up?” After asking yourself this question multiple times in a few years it starts to get scary when you still haven’t figured it out. It gets harder when your family starts asking year after year, reminding you you’re getting older and won’t have the same job opportunities much longer. I am turning 27 this year and have finally come to terms with the fact that it is okay to not know what you want to be when you grow up. I now have a full-time permanent job that I love, I’m still in Hamilton with my friends and living the same convenient lifestyle (15 minutes or less to drive anywhere in Hamilton!). There is progression available in my job and there are opportunities for further study and potential to move into other areas within my organisation, so the future looks bright. I have always wanted to have a business of my own and still haven’t quite decided exactly what that will be. I do know I want to get into property investing – whether that be my main business or a supplement to another business I am not yet sure. I am happy within myself that I have a secure job and goals for future career choices. I have options and as I was told when I was younger “the world is your oyster”. So as I am approaching 30 I am comfortable that it’ll be okay, the world won’t end because I don’t have ‘what I want to be when I grow up’ sorted by then. Coming into the workforce and talking to others in my organisation I realised that thinking a career was a one track journey is actually unrealistic. Yes, it may work for some people, but majority of people have moved around doing different jobs and roles over their lifetimes before they settled into what they are doing now. I even know some people that are in their 50’s and still don’t know what they want to be and yet they have lived a full and happy life on their journey trying to figure it out. I guess I am writing this to let you know that while you are stressing about ‘what next’ with the pressure you can put on yourself, especially in your 20’s, to figure it out – it’s okay. As long as you are doing something you are on the right path. Each choice you make opens up other opportunities and can lead to a world of options. You are still young and there is still time, so don’t let it get you down. Everything happens for a reason – whatever will be will be, if it’s meant to be it will – that is my ‘motto’ if you will. I live by that and it has worked for me this far in my life. It means I take responsibility for my decisions, I accept that everything happens for a reason and I believe as long as I learn a lesson from each decision or the results of my decision and do something to ensure it changes my future opinions/actions that is good way to live. I have been dabbling in growing a few different vegetables in my garden over the last few months, one of which is beetroot. It has taken a while for the beetroot to grow to an edible size but they were finally ready last week! I was going to a friends house for lunch and as I was brought up to always bring something to share when I go to someone else’s house (thanks mum) I decided I would make a raw beetroot salad. I shall write that recipe up soon as it is also delicious, however this post is about what I made with the beetroot stalks. As I cut the stalks off the beetroot and was about to throw them into the compost bin I suddenly thought ‘surely there must be something I can make with these?’ It seemed such a waste to throw away so much of a vegetable! My good friend Google came to the rescue and I found a delicious recipe that I’m going to share with you all so no-one has to waste beetroot greens again! The original recipe was called: Sautéed beet leaves with coconut milk & capers, however I didn’t have capers so mine is minus the capers. I must give credit to themindfulfoodie for this delicious recipe!! In a wide and deep fry pan, heat oil and sauté onion until translucent. Add garlic and sauté briefly before adding the beet leaves. Stir continually. Once the leaves have wilted add the coconut milk. Saute for a couple more minutes, then turn off stove. Season and squeeze over some lemon juice. I hope you give this a try as it really is delicious and full of nutrition. The greens are rich in calcium, iron and vitamins A and C. Beetroots are an excellent source of folic acid and a very good source of fibre, manganese and potassium. I woke up and felt like something different for breakfast/brunch. I decided that I would like to try out my new Tupperware silicone waffle mold. I haven’t had waffles before and also don’t bake often so this was an exciting little adventure for me! I like to watch youtube recipes as I’m more visual and learn best by doing, also there is less chance I can go wrong. This is the waffle recipe video I used – note: it’s in English and Spanish and makes approximately 10 waffles. Here is a handy conversion chart that I referred to a bit (some of the measurements in the video are US imperial). As you can see below I am slowly building up my Tupperware collection; becoming a hobby demonstrator has helped get even more products cheaper. Getting some of the products through earning incentives also made me want to practice more cooking and baking as there are some fabulous recipes that can be demonstrated at parties to help show the many uses of the products. Note: for those like me who don’t bake often tsp = teaspoon, Tbsp = tablespoon. Crack the eggs into a bowl and whisk. Tip: crack each egg into a cup first before adding into the main bowl – just in case the egg is less than desirable – it saves ruining all of your other ingredients. Add in the melted butter and milk while whisking. Sift in the flour and continue whisking whilst adding in salt, sugar and baking powder. 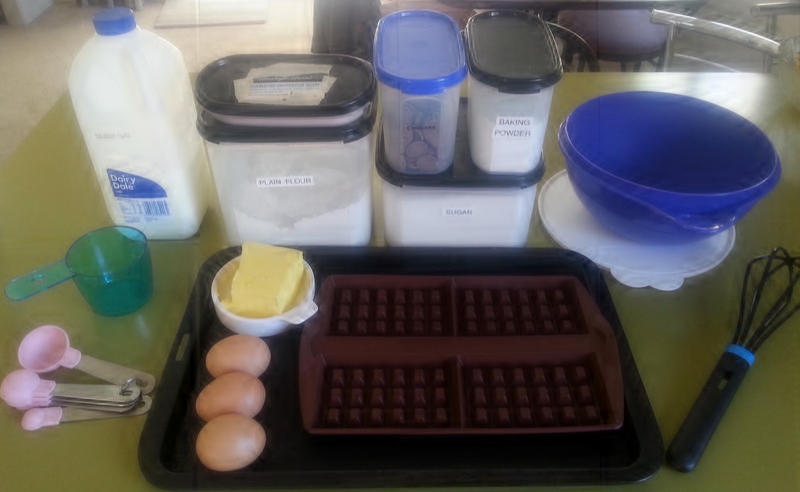 Tip: Ensure the Tupperware silicone waffle mold is on a sturdy tray before transferring to the oven. Pour in the mixture – just covering the raised bits. Place into a preheated oven and cook until crispy golden on top. Using oven mits, or a tea towel take out the silicone waffle mold and tip out the waffles onto a plate. Add toppings of your choice. I used melted chocolate, plain yoghurt, frozen mixed berries (slightly defrosted in the microwave jug) and golden syrup. The final weeks of my university came up so fast. All of a sudden I had been at university for 3 years; made a lot of friends, absorbed a whole lot about marketing and communications from my lecturers and made the most of opportunities that were available to me as a student. I became the president of the communications club for my final year and through that I gained a lot of experience in organising events and gained insights into the working world of communications careers. It is quite a daunting thought to know that the way of living you have known for a significant portion of your life is now over and life as you know it will change forever! The end of an era! In saying that it is also extremely exciting; like beginning a new adventure. Looking back at my time at university I am grateful to all those in my life that helped me gain as much as possible from my studies. Lecturers, my bosses and workmates, industry professionals, and classmates all offered their own advice or assistance and were part of my journey being a student which helped me to make the most of the opportunities that were around – even if I didn’t see them as opportunities initially. Meeting such a variety of people who all have different ways of studying, opinions on subjects and levels of academic learning gave me amazing insights into how people work and what works for me. During this time I learnt an incredible amount about myself, my abilities and the potential I have. By studying I learned different skills including time management, working with a variety of people, expectations from others in all different aspects of my life and how to create a good work life balance. I found it very important especially as the assignments were bigger and worth more that I set aside “me” time, where I could just watch a movie or go out to dinner with friends and not feel guilty for not using that time to study. I am the kind of person who likes to say “yes” often. Yes I can run that club, yes I can manage that sports team, yes I can work part time, yes I can study full time, yes I can look after children and pets, yes I can fit in time with my friends. So many YES’s that it took me a while (and someone blatantly telling me) to realise that it is okay and sometimes preferable for both parties to say NO! 1. Work/life/study balance is extremely important. Make the time to spend with your friends and family/pets without distractions, when you study – make sure it is effective; minimise procrastination. Work when you can and learn as much as you can from your workmates – they will help you when it comes to the real world and working full time – whether it’s simply as a referee on your CV or networking to get you a job, or making suggestions on how you could use your degree and work experience to create a career – other people see and think very differently so always be open to hearing their thoughts. 2. Take as many opportunities as you can (without overloading yourself). Being a student is a huge advantage when it comes to opportunities and networking. People love to help you when you are showing initiative and helping yourself. The more events you can attend, clubs you can be part of, and people you can meet the better off you are – these people all have knowledge and wisdom that could help you in any aspect of your life in the future so be sure to build networks and keep in contact – don’t burn any bridges! Even you fellow classmates could be in a position that could be beneficial to your family or career in the future so keep your options open. My mum always said ‘it’s not what you know, it’s who you know’ and the older I get the more I realise that is completely true! So network your heart out – practice and learn how to do it well, it will put you in good stead for the rest of your life! 3. Become friendly with your lecturers and tutors. As well as building them into your network, this is helpful during your years at uni, as I mentioned earlier – people are happy to help when they see you are helping yourself. If you show you are trying and interested in the paper then lecturers and most tutors will go above and beyond to help you when you ask. If you never come to class and are always late handing in assignments there is a very minimal chance you will get a grace period, even if your car really did “break down” on the day of your presentation. I was lucky enough to get extensions on a few assignments because I knew the lecturers well and was attending events that were assisting my studies and benefiting my career possibilities. The lecturers wouldn’t have thought twice about giving me a fail if I hadn’t been an “active participant” in my own learning. (I’ve seen it happen to others who don’t care and are of the mindset that ‘C’s get degree’s”. Well they may get a degree but they won’t help you get a good job, or a career! 4. Take risks – put yourself in situations that normally would scare you – you never know what you may achieve from it. Of course I mean this in a safe learning environment! For example as an elective paper I took ‘Public Speaking and Professional Speech writing’. I get nervous when I talk in front of people – whether I know them or not, so this was a challenge for me. However, I knew a lot of the other people in the class were feeling the same and I figured that it would be a good way to learn techniques of how to prepare speeches effectively, and deal with nerves in a tough environment so when it came to doing it in a job (for example if I needed to pitch to a client) I would have these skills to call upon. Interestingly enough I found this paper was helpful in preparing for interviews and talking to the interviewer as it is somewhat a practiced speech, just occasionally the questions are worded differently. This speech class also made me feel more comfortable and in control when I was cold calling companies to organise trips for my club and when I had to speak at our AGM and other events. 6. Be prepared – start assignments early. As early as you can write a mind map (brainstorm), do your first draft, second draft, third draft and final draft. Then take a look at the difference in quality between your first and final pieces – you will see the effort that went in pays off in the end. Also pay attention to the marking schedule – lecturers use this as a guide, so to ensure you are answering the right questions use this as your guide. Trust me it makes a huge difference and the lecturers will notice, both if you have or haven’t used it. To conclude – finishing university is bittersweet. I am no longer a “poor” uni student, however, with that I now have a much stricter daily schedule and less “holidays”. I enjoyed my time being a university student and all the experiences and friends/networks I built during my time studying. I am also extremely excited as my hard work for the last 3.5 years paid off; the piece of paper telling me I had completed my degree and could now apply to graduate (and the one saying I had been accepted to graduate) came in the mail – so it’s official, I have a degree!! I also got offered a full-time permanent job which I start on Monday – the first step in my career and the beginning of a new chapter in my life. So while I am going to miss the lifestyle of a student, I am looking forward to being a “grown up” in the real workforce. I hope that my advice helps, and I would love to hear if you have any of your own to add! This year was my first time working at the field days at Mystery Creek. For those of you who haven’t been before this is a big event (in NZ standards) that attracts over 120,000 people each year to look at farming equipment. It has expanded into luxury items for the farmers wives so they can enjoy coming to the field days too. Like I said, this year it was my first time working there – I thought it would be a good way to make some money in between university finishing and finding a full time job. I actually got a lot more out of this job than I was expecting. I learnt some sales skills, sold a new product (the eye massager! ), met a lot of great people and was absorbed into culture that is Fieldays. I am a people person so the highlight of this event for me was meeting so many people from different stalls; people from all over NZ had come to showcase their products. I was selling the Eye Massager, a first time product in NZ, across from my stall was one of three Ruahini port stands and around the corner was possom boots, and NewGen liquorice. During the course of the week I managed to talk to these stand owners along with a variety of others. The Ruahini port is made from fresh fruit and is unlike any other port you have tried! They had plum, blueberry, boysenberry, blackberry and cherry flavoured port, along with port sippers (which work the opposite to wine glasses – wine likes to be aerated while port tastes better if it is sipped from the bottom) that looked to me like a cats body and the sipper is the tail! Other than the actual quality of the product (coming from someone who didn’t like port – I am now in love with these flavoured ports! ), the best part about the Ruahini team is their passion for their company and their team. Damon is the creator/port maker and he ooozes love for the entire process and every person that has helped him on the journey. The whole teams passion was infectious, their stalls did extremely well and I believe part of that is because they have the stories to back up every part of their company. Alisha – Damons wife – is the artist who created the animal paintings that are a strong part of their brand and are on each port label. The reason I enjoyed this Fieldays so much is because I was surrounded mostly by NZ business owners who had put their life into their products and were extremely proud to share their stories and any advice – which to a young uni graduate is super exciting and helpful! Of course along with the stall owners, I talked to a tonne of customers who tried out the Eye Massager – when you love people and love talking this is a great job! The Eye Massager sounds strange however, it is an amazing product; it uses air pressure to target acu-pressure points around your face. I used it at least once every day and boy, does it relax you! Keep an eye out for these products!! They are worth every cent. That was just a quick recap on my first experience working at Fieldays 2014 and why I would recommend it to any student. It is a fantastic ground to network with a large variety of people and you never know where one conversation may lead in your future!